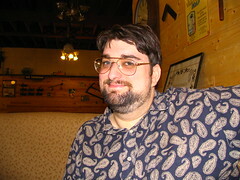 The Daily blog of SeeMidTN.com, pictures from Middle Tennessee and nearby cities. 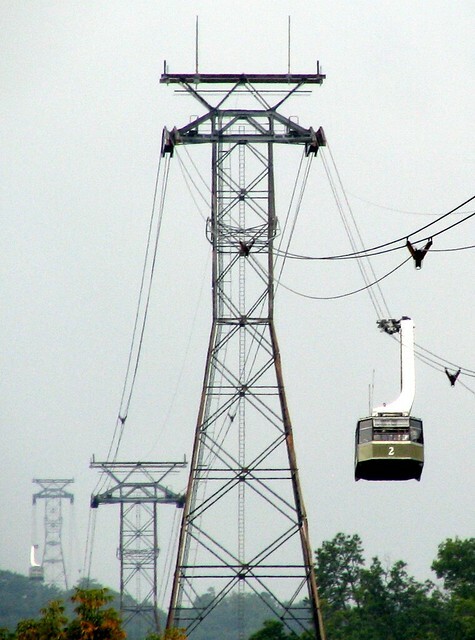 The line where the wood has been replaced said "World's 8th Wonder"
The premise here is that you pay $9 for a 15 minute aerial tram ride packed with a hundred people to get to the Ober Gatlinburg park. It's a scenic view if you can get one. I suppose it's ideal for the people walking the town, however Ober Gatlinburg does have a parking lot you can drive to. Besides, do you really want to be carrying your skis on this thing? 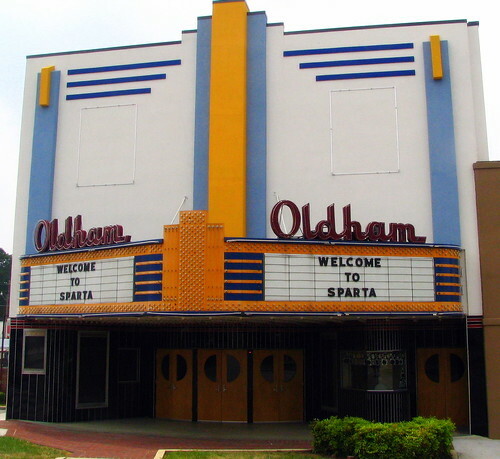 Oldham theater was built in the 1930's. It is now used as a sparta Visitor's Center as they try to refurbish the building to its older glory. 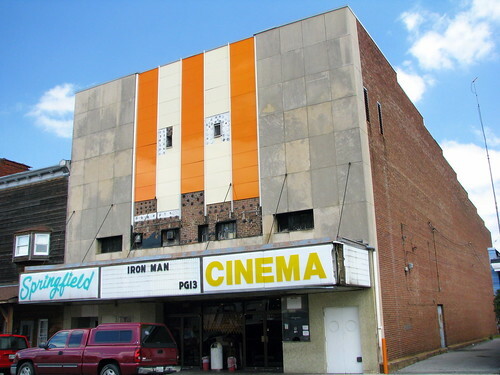 Unfortunately, I believe the entire inside has been gutted so that it couldn't be used as a theater anymore, but the town at least wanted to keep its iconic front. The Market Street Bridge in Chattanooga, TN just a couple of months before its exstensive renovations were finished. What makes this bridge different that any other bridge I've seen is its a Double-Leaf overhead counterweight Bascule Bridge. Has anyone ever seen, or ever photographed this bridge in it's "open" position? I'm not sure that I have recently. If you can see the water to the left of these people, that is Fall Creek which goes over the edge 110 feet to the bottom of the gorge to become Ozone Falls. These people, who drove up from Florida really want to see over the edge. The lady in green is holding her digital camera to shoot strait down while the lady in red holds her. It's quite a scary spot that I wouldn't want to walk to - I'd probably crawl to the edge as well. Ozone falls is an easily accessible waterfall - at least at the top. You can get to this spot with about a two minute walk from the small parking area by walking across flat rocks. However, there's no guard rails anywhere so it's not the best place for children. A better view of the falls can be had from below in a short but strenuous trail. One final note: Certain scenes from the 1994 Disney movie Jungle Book were filmed at this waterfall with it's easy to reach base. 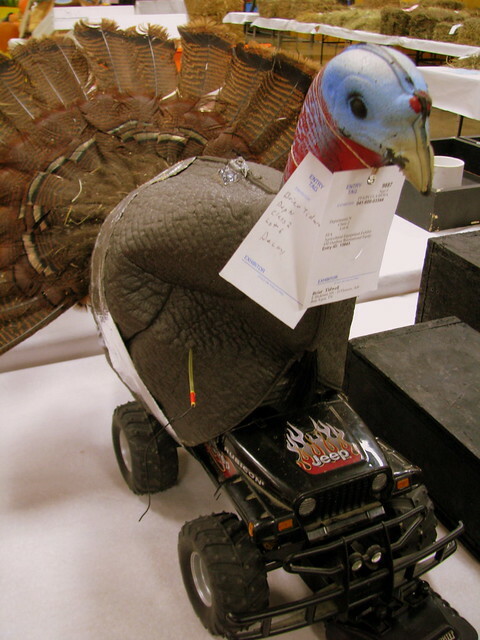 Have a good day, whether you spend the day with family around a blessed meal, watching football, or mounting a fake turkey atop a remote controlled Jeep. Seen at the 2009 Tennessee State Fair, submitted under the category of FFA (Future Farmers of America) Agricultural Equipment Exhibit: Small Outdoor Recreational Equipment. 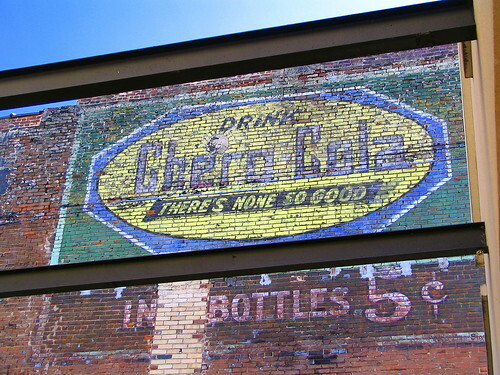 Chero Cola became Royal Crown Cola in 1934, so this sign is at least 73 years old! This is located along Main Street in Shelbyville, TN in the town Square. it's painted on the building which used to be home to Pope's Cafe. Just two or three years ago, I think there used to be a building here which would have prevented me from taking this picture. Now only the frame of the building remains, including the 2 beams in the picture. Before then, to view this ad, you would have to do so from an angle. "There's none so good" could be an insult if you think about it. The building originally started as the headquarters for Whittle Communications. Then when that company went out of business they had a large vacant property downtown. In 1998, the building was renovated and added onto to become the Howard H. Baker Jr. Federal Courthouse. The cupola with a large copper dome seen here was one of those additions added in 1998. The Sunsphere was built for the 1982 Knoxville World's Fair. Not too long ago, it reopened as an observation deck. The views are a little blurred in places and off-color due to the windows that we look through, but still it makes for a great vantage point of the city. If you've never heard the story, before Tennessee was a state, a small region in what is now eastern Tennessee formed a state named in honor of Benjamin Franklin. This state never became an official United State and after about 4 years it disbanded. The Capitol was Greeneville and this replica is a reproduction of a building in the main intersection of town which was believed to be the Capitol Building from 1785 to 1788. The original Capitol was preserved for many years. You can see a picture of it HERE. The building was carefully dismantled and reassembled in Nashville in 1897 for the Tennessee Centennial Celebration. However, the logs never made it back to Greeneville. That made it the lost capitol of the lost state of Franklin. The spikes were added to prevent birds from perching there. There's no reason imaginable that anyone would want to see Orme unless you like looking for old train stations. To get to here, I started in South Pittsburg, TN and followed highway 156 as it winded up the mountain. From there, I turned onto Orme Mountain Rd. which was a gravel road that winded down the mountain. I later learned that if I drove from the other way, it's flat the entire drive and passes by Russell Cave in Alabama. The tracks are long gone and it looks as someone has turned this station which probably looked very nice in it's day into a personal residence. At one time, Orme was a huge coal mining town and had a population of thousands, but the 2000 census reports 124 in the city today. 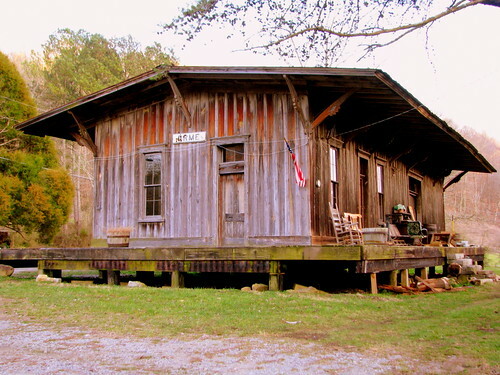 In 1902, the Sequatchie Valley Railroad built this depot and a 10 mile branch, known as the Orme Branch. The spur was completed in 1904 and connected Orme to Bridgeport, which was a major railroad hub. The tracks were removed in 1942. The Stones River National Battlefield is a park in Murfreesboro, TN along the Stones River in Rutherford County, TN. The park commemorates the Civil War battle that took place here on Dec. 31, 1862 and Jan. 2, 1863. The park was established using public and private funds, with significant help from the NCStL railway, and is now under the oversight of the U.S. National Park Service. 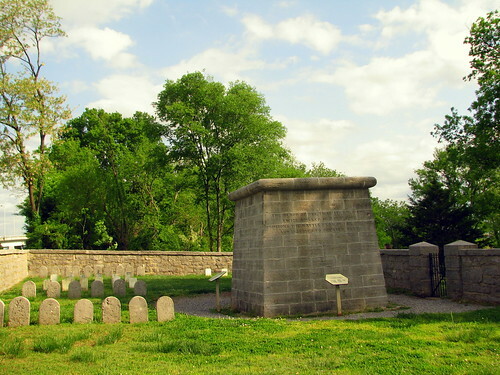 The Hazen Brigade Monument, built in 1863, is the oldest surviving Civil War monument standing in its original location, being finished before the war was even over. Hazen's Brigade to the memory of its soldiers who fell at Stone River Dec. 31, 1862. "Their faces toward Heaven, Their feet to the foe." Inscribed at the close of the war. The veterans of Shiloh have left a deathless heritage of fame upon the field of Stone River. The blood of one third of its soldiers twice spilled in Tennessee crimsons the battle flag of the brigade and inspires to greater deeds. Perhaps the most achitecturally interesting government building in downtown Louisville, the City Hall was constructed from 1870-73 (it says 1871 along the front.) 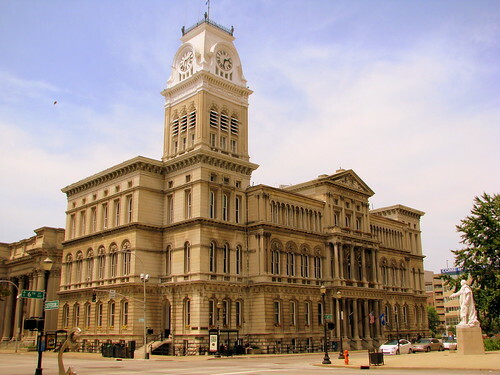 It was built with Indiana Limestone at a cost of $464,778. while the interior has been completely overhauled a few times, the exterior remains unchanged except for basic renovation. The architectural style is a blend of Italianate and Second Empire style. The pediment over the main entrance features a relief of the Louisville city seal plus a steam train with the word "Progress" inscribed on it. Atop many of the windows are engravings of livestock heads. The building is three stories tall plus a raised basement. 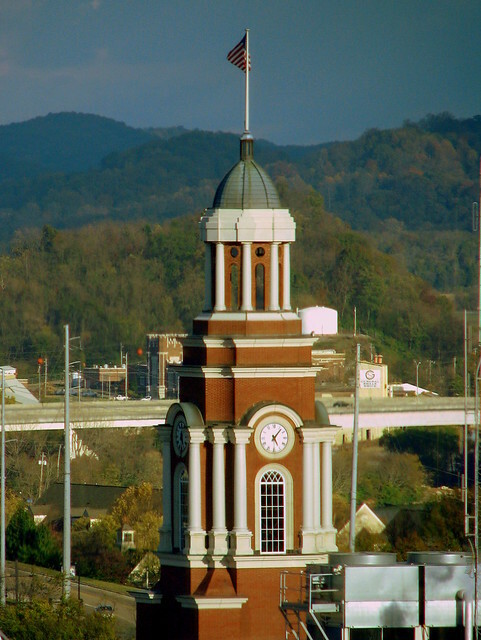 The most prominent feature is the clock tower. The original tower burned after only a couple of years but this one was rebuilt in 1876. the tower is 195 feet tall and has a clock face on all four sides, plus a mansard roof. Inside the tower used to be a three ton bell that rang until 1964 when the clock broke. (it was repaired but soon broke again). Today, it's primary function is housing the metro council offices and chambers. It is on the National Register of Historic Places. 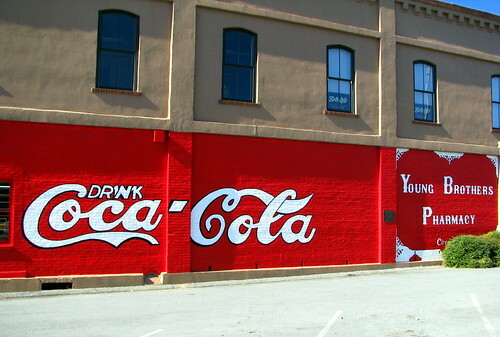 You see the old Coke murals all over the place, and it had to start somewhere. Not surprisingly, it wasn't far from Atlanta. This mural was painted on the side of Young Brother's Pharmacy in Cartersville, GA. In 1894, James Couden, a Coca-Cola syrup salesman, felt the vast exterior of the building would make a great location to advertise his product. 100 years later, preservationists wanted to see what this sign originally looked like and 25 layers of paint were carefully removed. 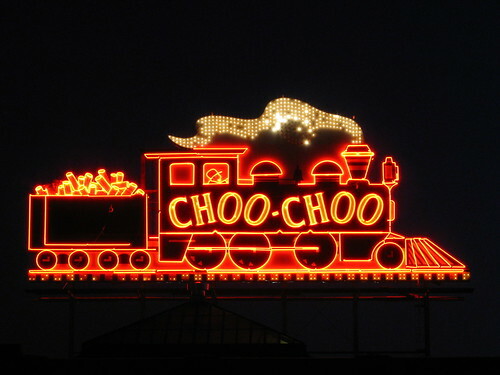 Thus, in 1994 the sign was repainted and preserved to look like it did a century earlier. 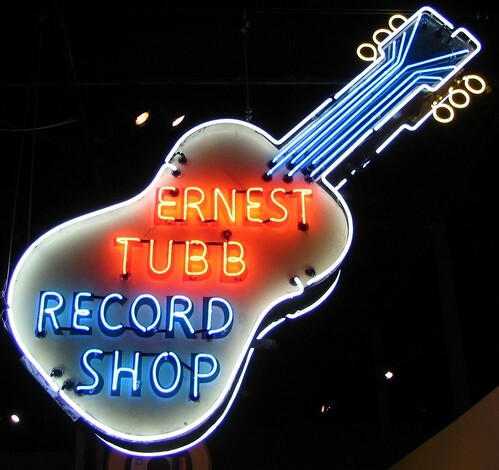 This sign is listed on the National Register of Historic Places. 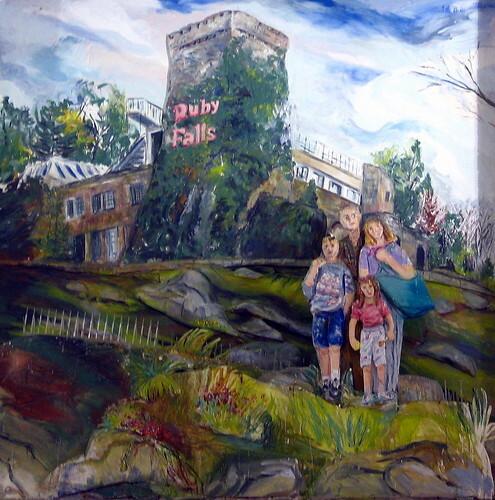 When it was painted, the target audience would likely be train passengers (railroad tracks are right behind me.) but a few decades later, the Dixie Highway passed by also. Mark Twain never lived 'round these parts, but his parents spent some time here in Jamestown. John Clemens was the town postmaster for a while, as well as a lawyer. 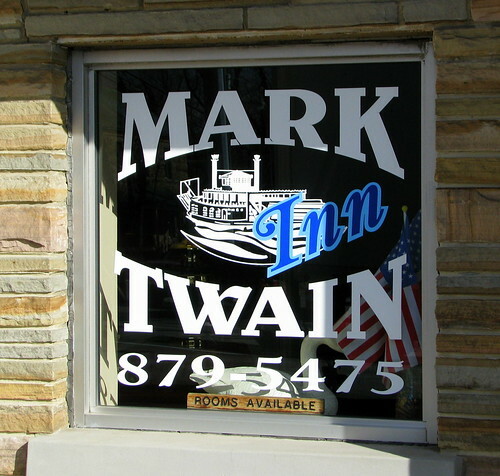 Mark Twain Inn is across from the county Courthouse. 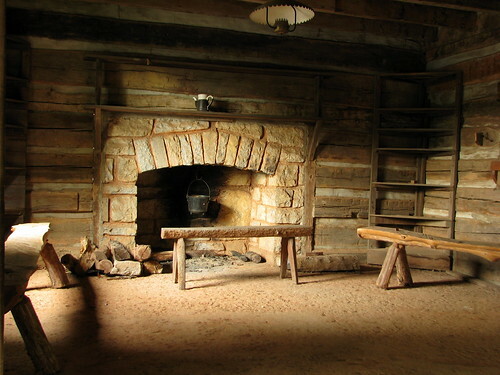 Twain did talk about Jamestown in his writings, caling it Odebtown, after the nearby Obed River. The interstate doesn't always make for picturesque views. 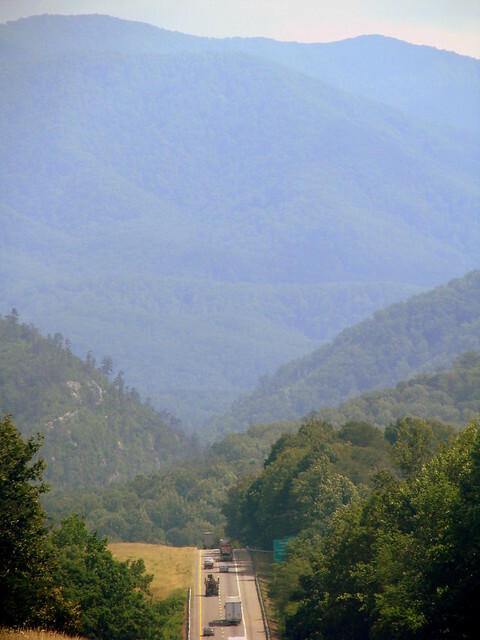 However, when I-40 is about to go through the mountains around Tennessee and North Carolina, I believe the view is breathtaking. And then we drive the interstate up there and it gets even better. 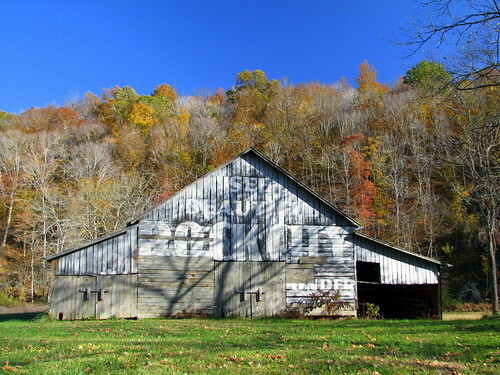 Located in the small town of Williamsport, TN along the Old Williamsport Rd. 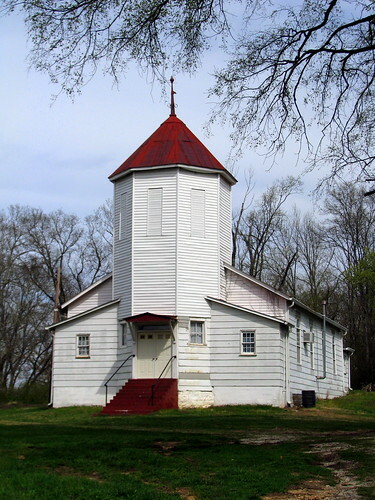 in Maury County, this African Methodist Episcopal church building dates back to 1923. The most distinguishing feature of the building is the Octagon-shaped area above the entrance and topped with the red metal roof. It appears at one time, this area had three windows that have now been removed. This bridge used to carry highway US31 over the Elk River in Elkton, TN, a city on the south side of Giles County. 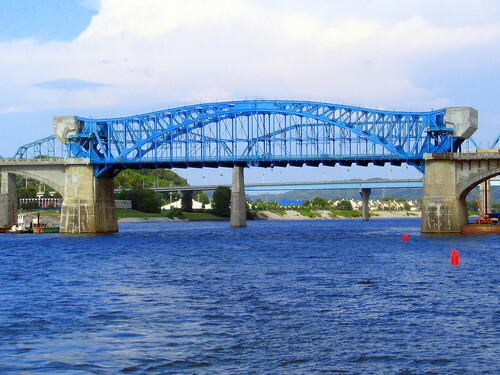 The bridge was built in 1924 by Montgomery and Parker Co. The cenral part of the bridge is one riveted 160 foot Warren through truss with Polygonal top chords. The deck is 22 feet wide and the total bridge length is 692 feet, most of which is a long approach on the southern side. 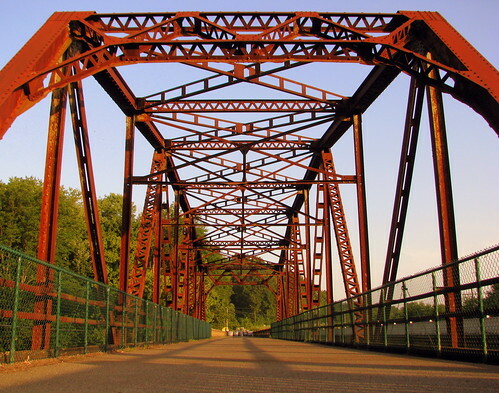 This photo was taken about an hour before sunset, giving the rusty bridge a nice glow. The central Shopping District of Morristown has one thing that really stands out. If you go to any preserved old town, you're going to find in the heart of town, a bunch of old buildings with interesting storefronts and various older acrhitectural styles. 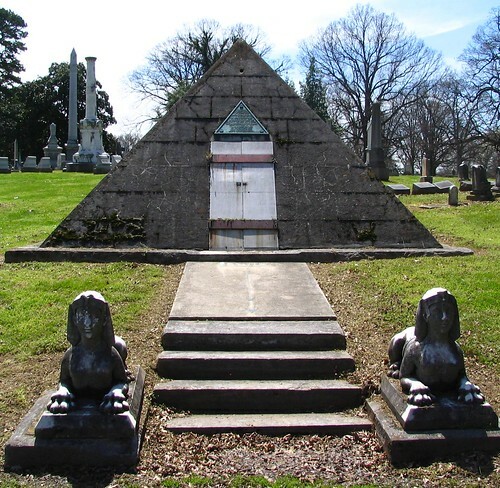 In the late 1960s, Morristown decided they had a problem needing a unique solution. 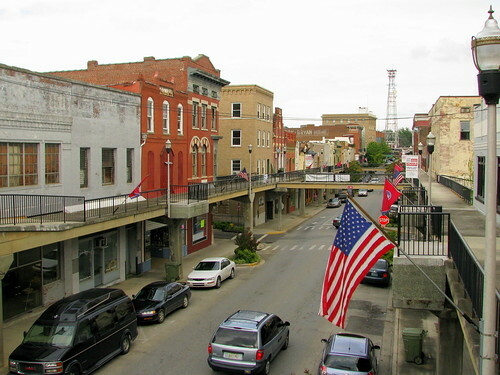 Town leaders decided to build second-story skywalks, which they called the SkyMart. The idea was you could double the number of businesses along the main strip, potentially doubling the number of shoppers that come to town. 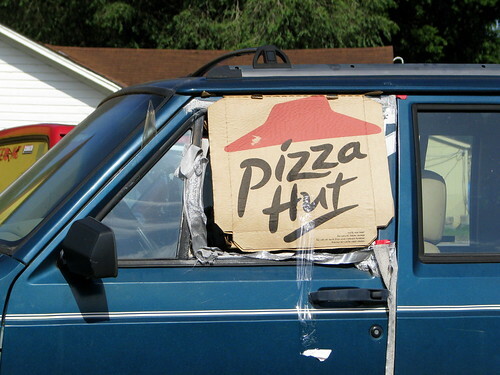 Did it work? If it had, you'd be seeing it in other small cities, and you won't see it anywhere other than Cincinnati, which is a big city where it didn't work. I don't know what's transpired over the last 40 years, but when I walked the skywalk, I didn't see any businesses I could shop in. On any given day, I suppose you could find walkers, locals getting to their upper floor apartments, and the occasional tourist. Even still, if you go to the Morristown website or find a Hamblen County brochure, this will be listed as a thing to see. Photographically, you can see things you won't see anywhere else, like getting up close to a ghost wall ad. On the down side, you can only get the top half of some of the more interesting buildings. 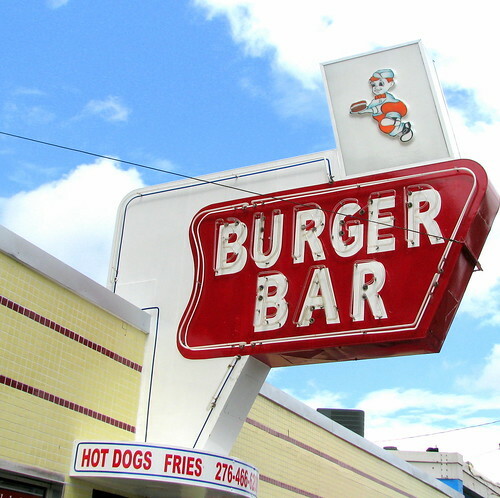 According to legend, this could have been the last place Hank Williams stopped to eat before he died - as in his driver apparently asked if he wanted a bite to eat while passing by here and Williams said no. Falls Mill Falls as the name suggests is at Falls Mill in the western side of Franklin Co., TN. It is the smaller and lower falls along Factory Creek. 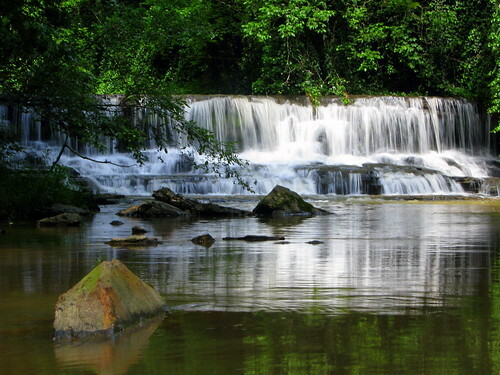 The stream tumbles 6 feet over a block-style waterfall into a calm pool. Enoch Tanner (E.T.) Wickham was born in 1883 and lived as a farmer most of his life in the small town of Palmyra, TN on the western side of Montgomery County. After retiring in the early 1950's, E.T. started quite a hobby. Starting then and continuing for nearly two decades, he started making concrete statues. After each statue was built, it was places on the side of the road on his property. Soon, after he started building these, he put up a sign that said Wickham Park, and that is what the place became known as. The statues started with animals and family members but soon became famous Tennesseeans and Americans. Luckily, the family has stepped in to preserve the statues (or what's left of them) and the memory. 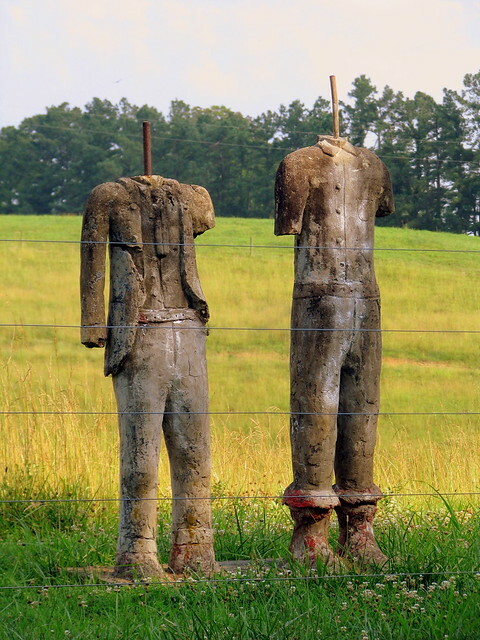 In 2006, some of these statues were moved to a better location, making them easier to see, but also behind a barbed wire fence to cut down on vandalism. They also have a website wickhamstonepark.com/ which provides very thorough information on the statues. These two statues used to be a collection of four in one piece. On the left is Lester Solomon and on the right is Daniel Boone. There used to be another two to the right of Boone, Chickasaw tribal leader Piomingo and Sitting Bull. You've heard of Daniel Boone, but Lester Solomon was the county soil conservationist and friend of Wickham. 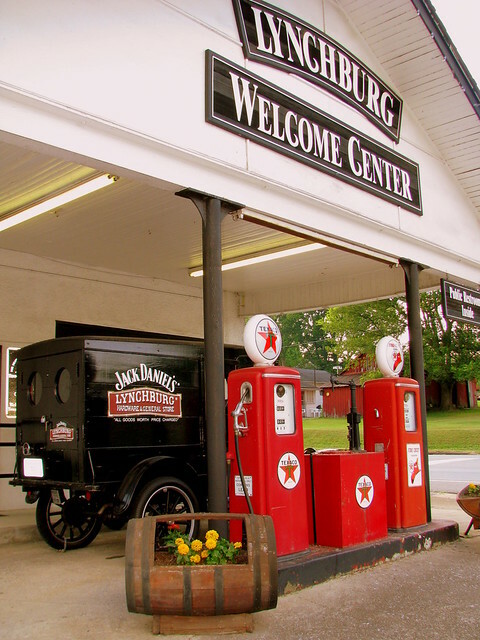 Located at the corner of TN55 and the turn to the Lynchburg town square, the welcome center is a converted and restored vintage Texaco gas station, along with its Fire Chief pump. I am not sure what kind of wood-sided vintage wagon is parked here. It has the logo of Jack Daniels and the Lynchburg Hardware Store. Also, an old whiskey barrel is used as a flower planter. When the Simpsons Movie was announced, they planned to show the film premeir at one of the Springfields in the country. A key selling point of the Springfield, TN cinema is that it's only one screen and wouldn't have to share marquee space with a second film. Located on Main St. about a block south of the town square. 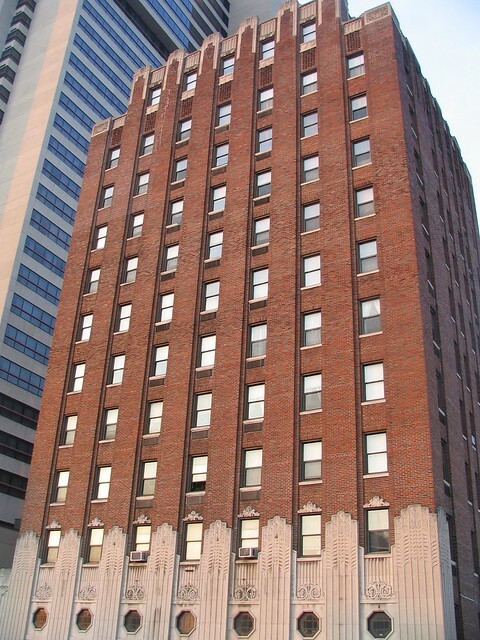 The James Robertson on 7th Ave. is Nashville's second oldest remaining hotel. (The Hermitage is 1st.) Built in 1929, the hotel was named after the founder of Nashville. The architect that designed this building also designed the TN State Supreme Court building (next to the Capitol) and the Frist Center (old post office). Almost not surviving the great depression, it had gone back-and-forth from a hotel to apartments since 1978, when it permanantly became low income dowtown housing. The Renainnace hotel dwarfs it in the background. 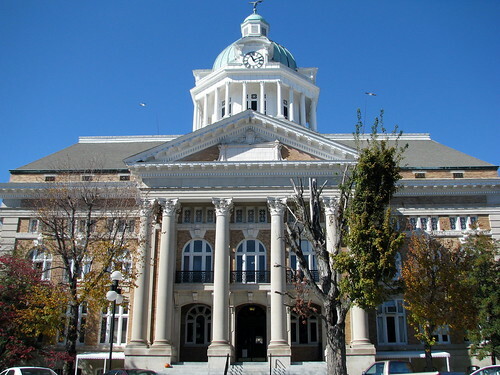 The Giles County Courthouse in the center of the town square in Pulaski, TN was completed in 1909. It's a large 3 story brick structure measuring 60' x 150' with a large central cupola. The neoclassical design is marked by tall Corinthian Columns. On the inside, a balcony encircles the third floor while 16 caryatids (female faces) hold up the arched vault of the rotunda with a stained glass skylight. Inside the top of the cupola, a bell forged in 1858 strikes on the hours. located on US 31. The entire district is on the NRHP. Their goal was to have the finest courthouse in the state and they may have succeeded.